The series of books includes the compositions of a playwright Yuri Dimitrin “The selection” in five books. This book is the first, and it is dedicated to comic opera genres. 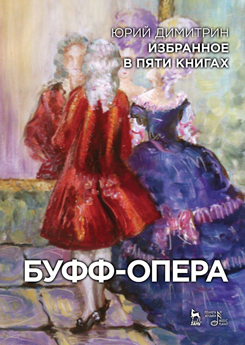 It contains Russian versions of libretti, which were staged in Russia more than once. They are Mozart’s singspiel “The Pretend Garden-Girl”, two buffa operas “The Secret Marriage” by D. Cimarosa, G. Donizetti’s “The Night Bell” and comic opera “Rita”. In the appendix of the book there is a libretto of G. Donizetti’s buffa opera “Viva la pappa!” which has not been staged yet. The book is intended for the musical theatre performers, composers, librettists, music experts, the teachers and students of art academies, and for a wide range of the enthusiasts of theatre.